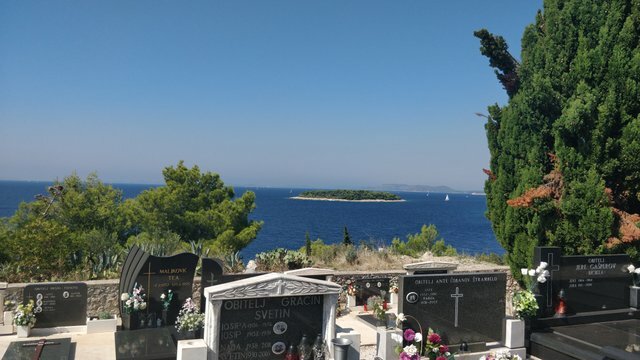 We wrote about our first week in Croatia here. 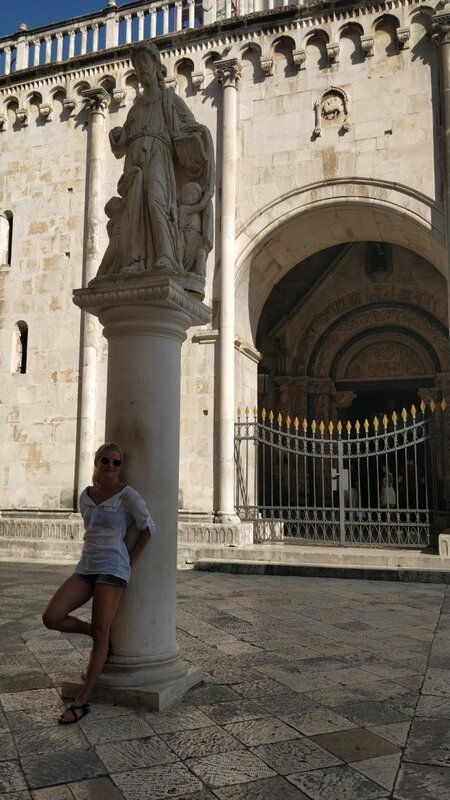 We started the second week in Zadar. 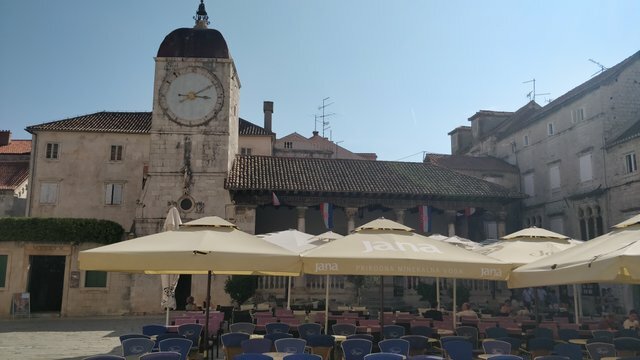 We left the Istrian peninsula for our next stop and my favourite town in Croatia so far. 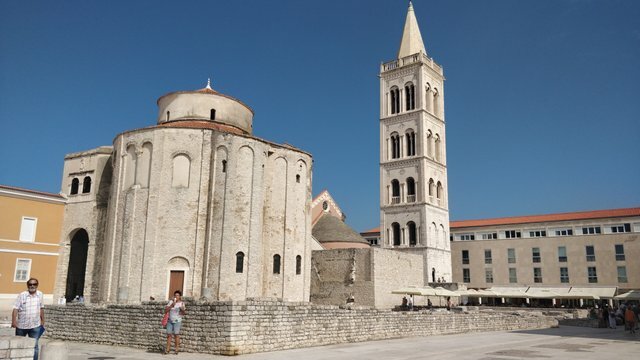 Zadar is a 4 hour drive from Pula. Mode of transport: We drove the rented car back to Zagreb and took a bus (Flixbus again) to Zadar. Accommodation: Apartment Andriana The biggest apartment we stayed in so far, I could have stayed there so much longer. 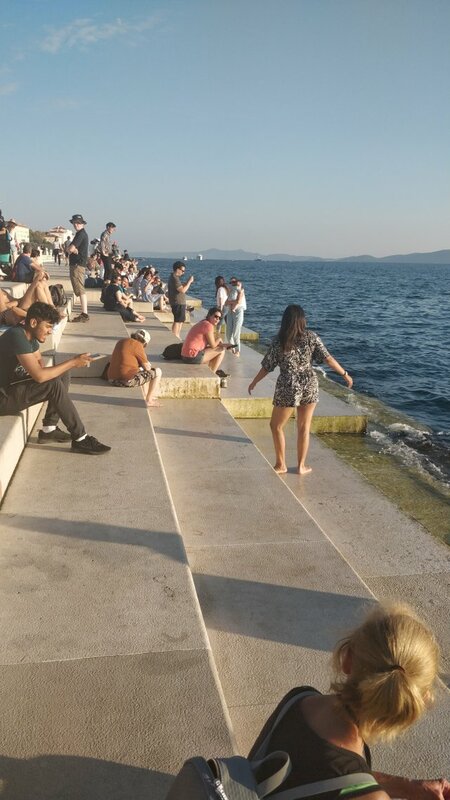 Visit the Sea Organ. It’s a unique structure right on the shore. There are pipes installed in the water with holes in the pavement. Through these pipes the sea creates music. Nice and peaceful if the sea is quiet, but it’s loud and bit creepy when there are big waves. Make sure to visit in the evening so you can watch one of Croatia’s most beautiful sunset here. Or, as Alfred Hitchcock said, the most beautiful in the world. Stay right where you are, in a few minutes after sunset the Greetings to the Sun will light up. lot’s of people will be gathering around it so you cannot miss it. This structure was installed here by the same Croatian architect as the Sea Organ. 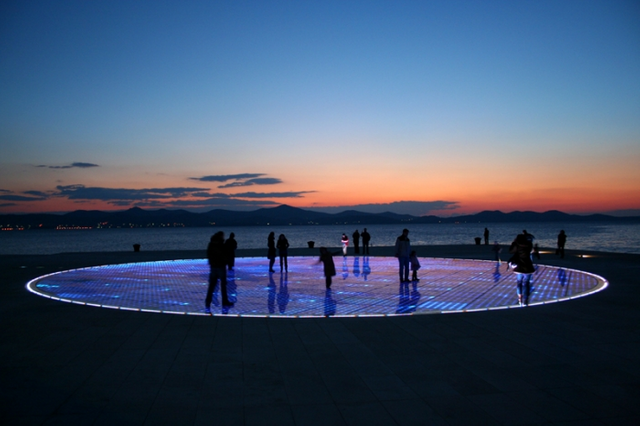 They compliment each other so well, along with that sunset they make a perfect evening plan just before heading off to dinner or out for a drink to of Zadar’s little bars. 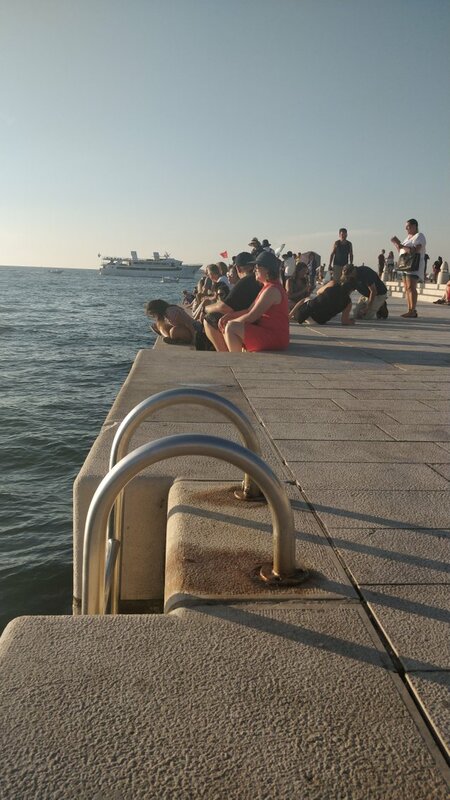 You can jump into the water right from the city’s promenade and go for a refreshing swim. The water is clean and there are steps going down into the water all along the promenade. Although we didn’t take a swim (too cold for us in September), we saw many people doing that. Visit the Forum. It’s located in the centre of the Old Town and you can walk along the remains of the Romans here. There are a few cafes here where you can chill out and admire the architecture around you. the Forum was built in the 1st century BC. Wonder around the little cobblestones streets and take in the atmosphere. This was what we did here most of the time, just walked around and wowed at all the beautiful buildings around us. Dugi Otok is one of the small islands off Zadar’s coast. It’s 45 km long and about 3-4 km wide. 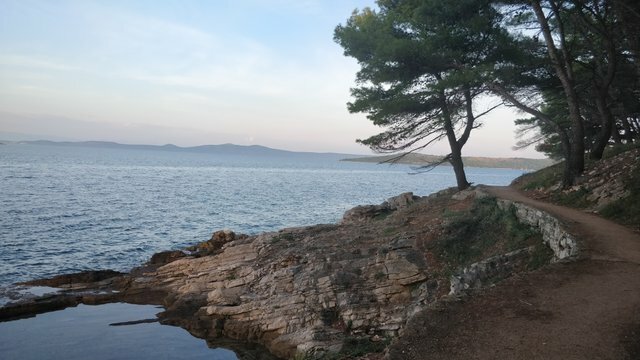 We chose this island because we read about its beautiful nature, the natural park Telasnica on the south you can easily visit on your own and the sandy beach on the north. Mode of transport: The island has quite a few ports all along the coats where different ferry companies go several times a day. Tickets cost about 20 kuna (2.7 EUR) each way. 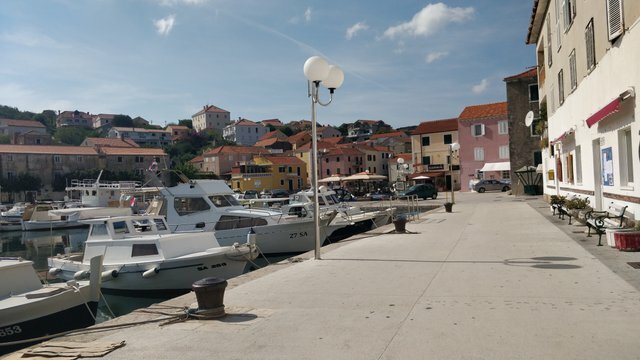 We chose to go to the south side of the island, to the town of Sali, which is also the main town on the island because we found a good Airbnb there. We needed about an hour to discover Sali. It’s a very small town with a few restaurants and cafes built along the port, but other than that there are only a few more houses up the hill. We found a few concrete and rock beaches outside the town, but those are still not our thing. We found a few concrete and rock beaches outside the town, but those are still not our thing. The next day we rented a motorbike from the ice cream shop on the corner (they have a sign up for this) for 200 kuna (27 EUR) per day. Quite expensive, we were shocked but motorbike rental is expensive on this small island. 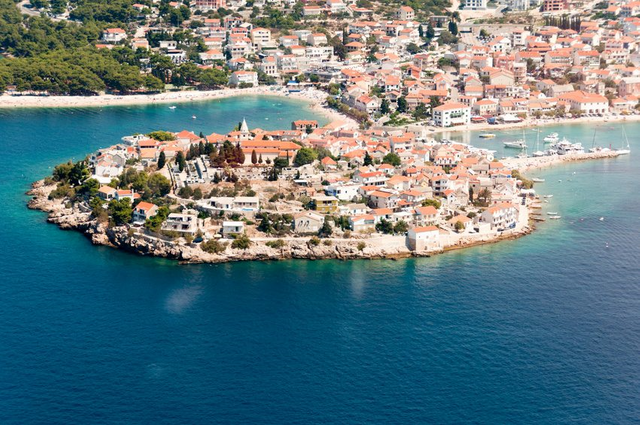 TIP: you’ll probably get a much better deal if you rent a motorbike in Zadar and take it with you to the island. The roads on the island are very good, the views along the way even better so renting a bike is a great idea here. They do rent mountain bikes here too, but the distances are too large and the hills too steep to really see anything on one of those. We saw many people going from Sali to Telasnica by mountain bikes, that’s only about a 30 min bike ride. So it really depends on which part of the island you’re staying and what you want to see while you’re there. we wanted to see as much as possible (as always) so we got a motorbike. Our first stop was Telasnica. There is an entry fee of 40 kuna (5.4 EUR) to pay here, you’ll get a small map and an explanation on where to go and what to see. We headed to the Salty Lake and walked around it. 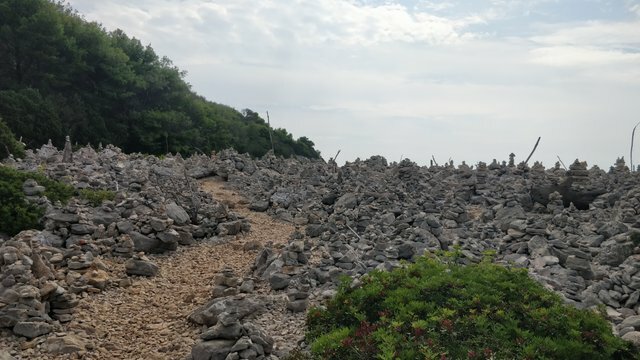 We found this rock formation just behind the Salty Lake. Someone started putting rocks on top of each other and it developed into an art work. Our plan was to go all the way up north to the sandy beach of Sakarun, but as we found out, 45 km on a motorbike was just too exhausting for us to do in one go. So we drove in north direction and stopped at a few villages on the way, all of them quiet, a little port being its main hub. We had lunch at one of these villages. On the way back we stopped by in Zaglav, which is where the island’s only petrol station is. So if you’re renting a motorbike, you’ll need to calculate a trip to this place in for sure. 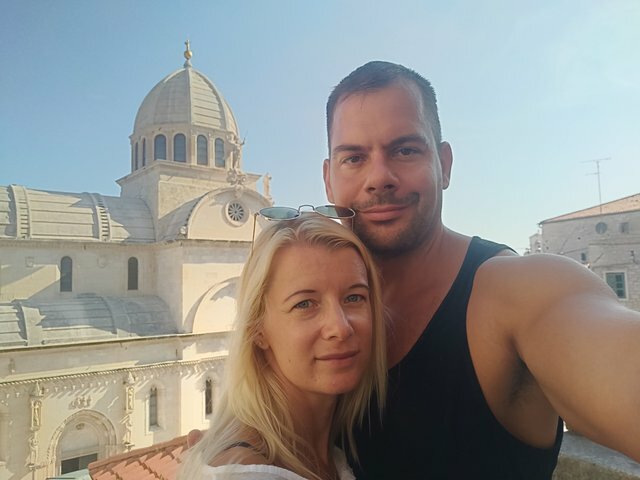 Our plan was to look around Split for one day an then rent a car the next day and explore Sibenik, Primosten and Trogir. Mode of transport: From Dugi Otok we went back to Zadar, and from there we too a bus to Split. (Flixbus, 8 eur each). The bus journey was only about 3.5 hours long. 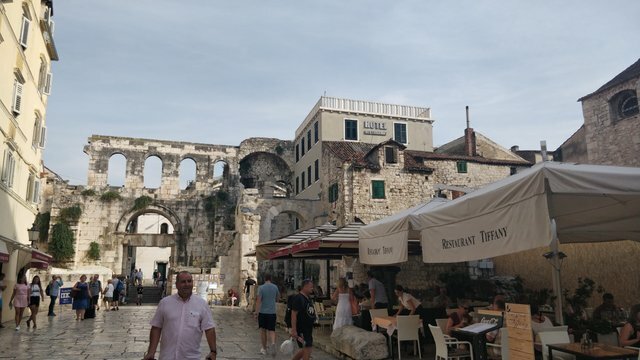 Visit Diocletian’s palace: it was built for the Roman Emperor Diocletian in fourth century AD. It forms about half the old town. While it is referred to as a "palace", it can be misleading as the structure is massive and more like a large fortress. About half of it was for Diocletian's personal use, and the rest housed the military personnel. We couldn’t enjoy the palace properly, because it was incredibly full of tourists. It was impossible to walk, see anything in front of you because of the crowds. So we left quite quickly and went to see the seafront promenade instead. We went to Marjan Hill, a 178m high hill to the north west of the old town. There are several walking trails and a café called Vidlica on top of the hill with an awesome view over the city. We went to the beach. 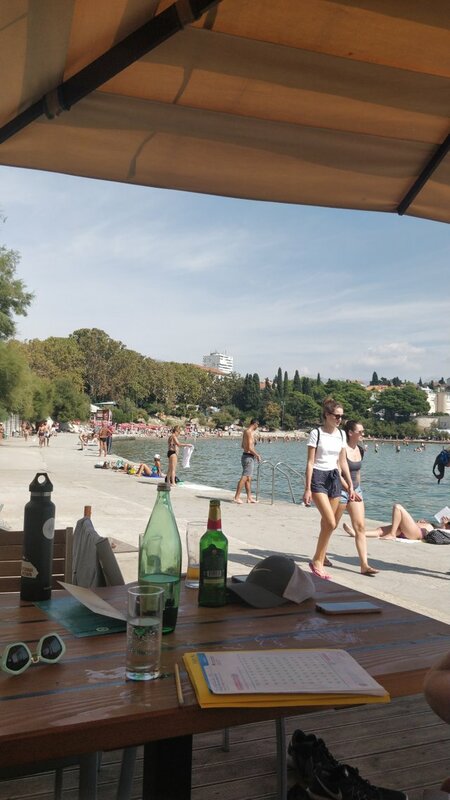 Bacvice beach s the closest to the centre and it’s also the only sandy beach in Split. We just weren’t able to choose between these three places, and they are so close to each other that we just decided to see all of them in a day. We rented a car from San Diego Tours. We couldn’t see very much in either of these towns because we crammed them all in one day, so below I only list what we saw and what caught our eye, but there’s much more to do and see in all three of these places. Mode of transport: Rented car from San Diego Tours. They were ok, the car was about 20 EUR for the day, but it took them 3 weeks to send us our deposit of 600 euros back. Our first stop was Sibenik. 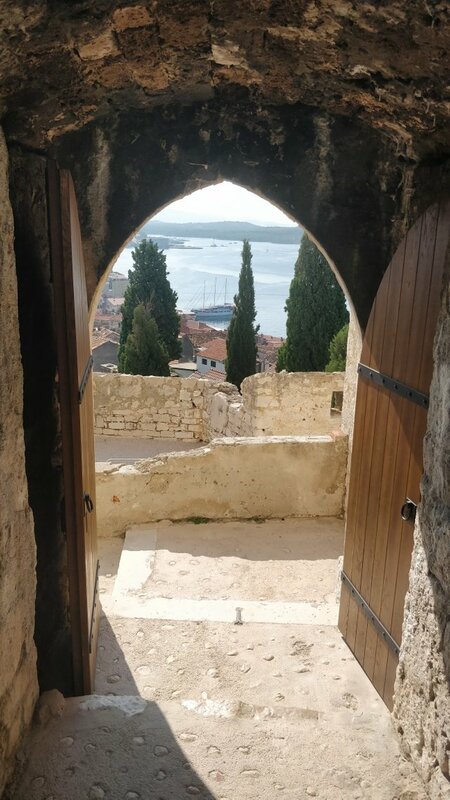 Here we wanted to see the Fortress of St Nicholas, but as Sibenik has four different fortresses, we ended up going to St Michael’s fortress instead. The view is the best from St Nicholas, but as we discovered, St Michael is quite amazing too. You have to pay an entry fee of 50 kuna (6.7 EUR) at each of these fortresses, and you can either buy a ticket for St Nicholas and Barone, or St Michael and Tvrdava Barone. 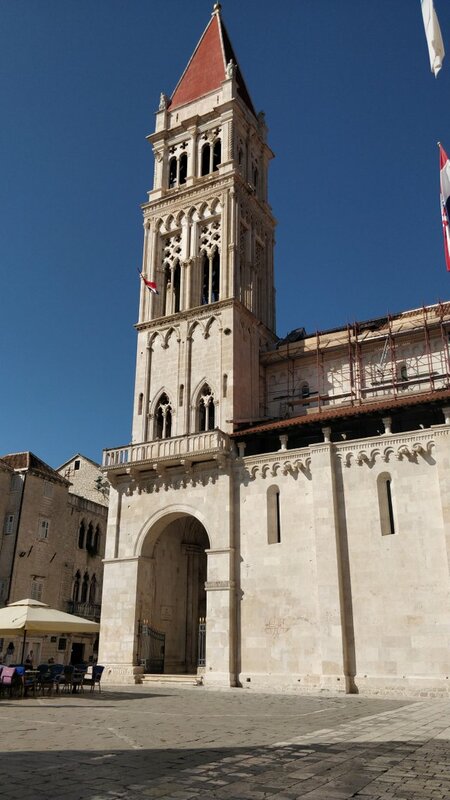 We saw the Sibenik Cathedral while wondering around the old town. Since 2000 it has been on UNESCO’s list. It was built between the 15th and 16th centuries and it’s one of the most significant cathedrals in Europe, it’s been constructed entirely from stone as the only one of its type in Europe. To make it short, it’s worth seeing even if you’re not religious. This is actually a separate island but it was connected to the mainland by a causeway. We looked around the old town, although this one is very tiny as the town of Primosten is quit small. Here I was set on going to the cemetery on the top of the town. It’s one of the most peaceful places I’ve been to and the views on the sea are amazing from there. We went to the beach here, which was surprisingly nice. 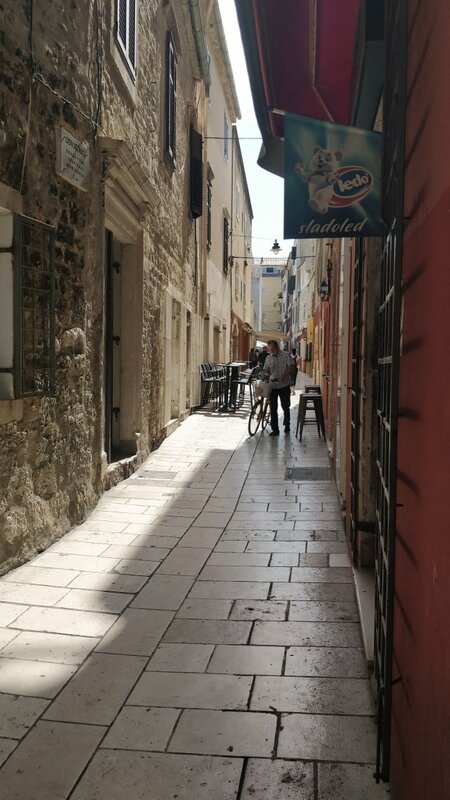 The whole old town of Trogir is included in the UNESCO list for its beautiful Venetian architecture. It is the best-preserved Romanesque-Gothic complex in all of Central Europe. It’s grandest building is the Church of S Lawrence. I totally fell in love with the old town here, it was so amazing. Other than walking around the old town, we had a drink at one of the cafes on the seafront promenade. We drove back to Split in the evening, exhausted, ready to do nothing but sleep after the 20km we had in our feet that day. The next day we went back to Budapest by bus, starting at 7:30am from Split, arriving in Budapest at 10pm, but we had a 3.5 hour break in Zagreb. 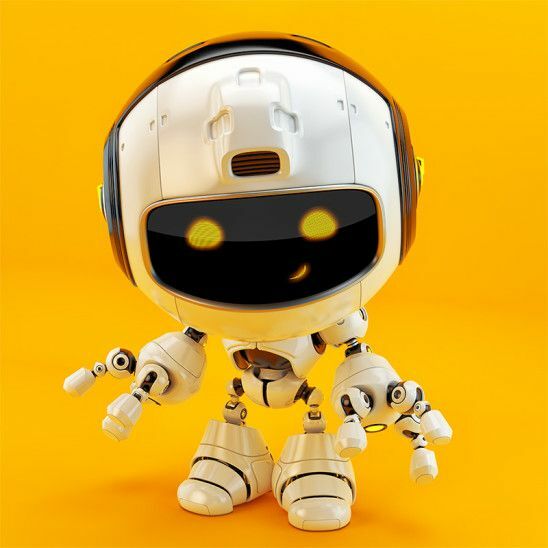 You got a 3.70% upvote from @booster courtesy of @peterveronika! Thanks for detailed travel info. it is inspiring. I upvoted your contribution because to my mind your post is at least 9 SBD worth and should receive 219 votes. It's now up to the lovely Steemit community to make this come true. Resteemed to over 19400 followers and 100% upvoted. Thank you for using my service! 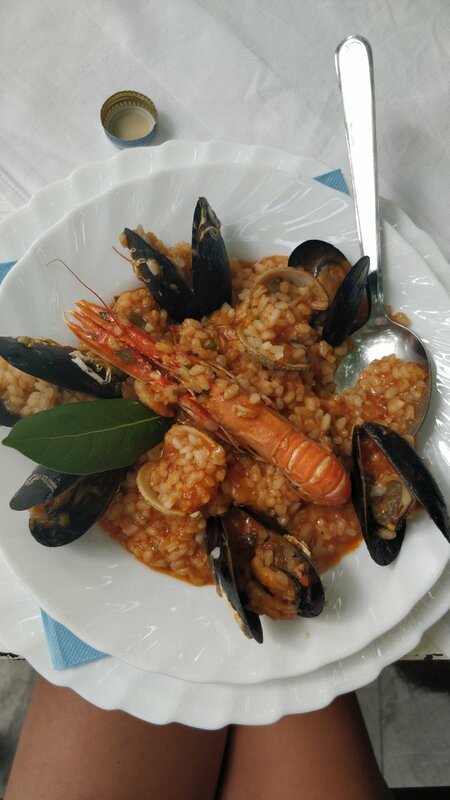 Become one of our VIPs for 1 month free resteems and upvotes. Byteball is doing a airdrop on Steemit, where you can get 10 $ - 160 $ for free. More infos here.